I stitched out 5 of the more traditional snowflakes from this recent set on pale gold organza, using 2 layers of Floranni Wet ‘N Gone. I used pre wound bobbins as the seem to have the thinnest of threads. I changed the colours for a slightly different colour scheme. 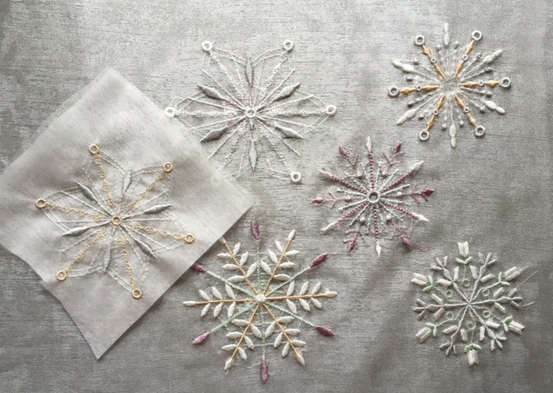 They looked lovely on the organza and I decided immediately to resize may favourite snowflake, reducing it 10% to see if it would layer nicely with the orginal design. Looking at the snowflakes all stitched out had me imagining all sorts of uses for them! They would look lovely dancing across a sheer scarf, and I wonder if they could be added to the Christmas tree in some form or other! More of that later, I digress! It is my practise to remove as many of the threads from the back of the embroidery before washing the stabiliser out. While the fabric is flat it is so much easier to see everything that needs snipping. Remember that it is personal preference how long you soak your embroidered designs. If you want them to be very soft and floaty then an overnight soak in water with a spoonful of fabric conditioner will do the trick. Leaving some stabiliser in the design will make them stiffer as though they have been treated with starch, but these are very light and delicate designs so I advise washing and soaking them. You can always spray them with starch later on if required. 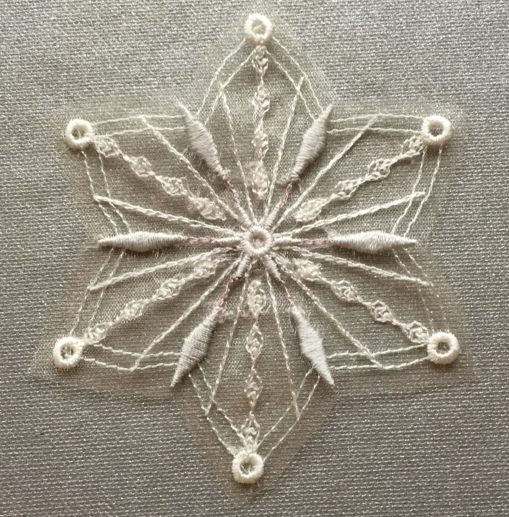 Now here is the first snowflake trimmed about 1/8″ away from the stitches. I wouldn’t attempt to get any closer and the edge makes a nice feature. It is important to use very sharp scissors and cut in long strokes to get straight edges. You may want to consider using speciality scissors like pinking shears but I wanted my edges to be simple and not detract from the snowflake. Now this was the snowflake that I did not think would work, so always attempt and test out your designs as you may be pleasantly surprised. This snowflake on the right does not look so good as its shape is not so defined. Next time I will show you how I set about attaching these snowflakes on to a card and also how I give them some extra Christmas sparkle. This entry was posted in Embroidery projects and tagged 3 Dimensional embroidery, Christmas. Bookmark the permalink. Oh my goodness! They are just lovely. Thank you for showing them. They’re beautiful, Hazel! All of your designs are. I have a special place in my heart for snowflakes probably because I’ve never seen that many in my life. I know your snowflakes are the cream of the crop. Thank you for sharing them.